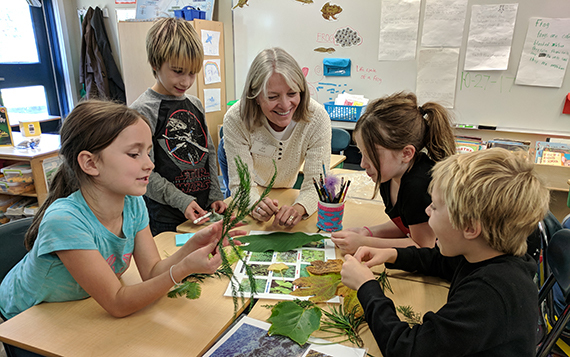 Students in Lauren Serpa’s third grade class examine leaves from the “dinosaur plants” lesson with PHA Youth Education Coordinator, Jill Bouck. This program introduces children to the evolution of plants whose ancestors existed when dinosaurs roamed the earth. Although the dinosaurs met their demise in a dramatic mass extinction, plants persisted. Many evolved in complex ways, but others remain much the same; these prehistoric plants, such as dawn redwood, monkey puzzle tree, ginkgo, and magnolia, fascinate us with their beauty, resilience, and ancient heritage. PHA Youth Education Coordinators Betsy Dripps and Jill Bouck recently completed a busy fall season providing programs for school children from all five Island elementary schools and the MV Public Charter School. This year Betsy and Jill were joined by new part-time staff member Kendra Buresch. As always, our team is assisted by a wonderful group of dedicated volunteer school guides, who lead students in exploratory lessons on-site at the Arboretum. The PHA youth education program introduces Island children to the special place that is the Arboretum and is free of charge to all schools. During classroom visits, each child receives a hands-on lesson led by Betsy, Jill, or Kendra, who arrive with seeds, leaves, flowers, and other natural materials for exploration. At the Arboretum, each class is divided into small groups of student scientists who embark on their field studies with a volunteer school guide. With the scientific background provided by the classroom visit, students revel in the opportunity to learn from nature in PHA’s “outdoor classroom.” Our volunteer guides encourage everyone to observe, ask questions, and make discoveries. Students discover landscape and buildings, plants and animals, and sounds and smells that combine to create a memorable experience. Before leaving PHA, they make a drawing and discuss what they’ve seen, learned, and enjoyed. PHA works hard to align our kindergarten to fourth grade curriculum with the next-generation science standards that the schools are adopting in their classrooms. By staying current with the curriculum standards, our youth programs provide a valuable resource to teachers. These educational field trips reach students of all learning styles: some kids charge forward with exuberance, while others become absorbed in examining a seed or flower. We continue to be motivated by Polly Hill’s passion for plants, nature, and learning through observation. Polly said, “Educate yourself. Learn. The learning is the fun.” Making learning fun is a natural outcome of a field trip to the Polly Hill Arboretum!